Dear friends: As you can see, I have decided to alter the course of my blog "Cauldron Born" and transform it into a journal and record of the various deeds and doings of my beloved family and my Heathen religious/cultural community- which are now exactly the same thing. It only makes sense that those who seek to really vivify and engage the Elder religious patterns of Hamingja within themselves should find their way to a family focus: the family- not the individual- was the central and basic unit of historical Heathen cultures, and it was the primary grouping which regularly experienced the majestic doings of the Gods and wights and the pervasive, transforming power of the Ancestors. It was within the family context that the religious experiences of the Heathen came to make sense and have the power they had. The family is the very root and seed of any greater community worth the name, and until family consciously achieves its own spiritual dimension, one really only has a collection of relatives. This online transition is taking a bit of time as I hammer out aesthetic transformations and the like, but it will be complete very soon. The good news (hopefully) for my readership is this- nothing really changes but the layout of this blog. What's really changed is me: I've learned to integrate family life- my wife, my children, and myself, and all of our deeds and sharings- with the Heathen spiritual life and worldview, forging a "Hearth", a Heathen family, the true heart of any later extended notion like "Kindred". With this powerful heart and soul focus, which is an unassailable sanctuary for a soul like mine, my writings on all aspects of modern Heathenry and the emergence of modern spiritual practices and beliefs nourished in the hamingja of historical Teutonic/Germanic and British Isles Paganism can continue as before, but now better and stronger. The new strength comes from the fact that I have around me the community that Wyrd wove for us in blood and flesh- the most direct and powerful expression of hamingja possible, persons joined together by Fate and by blood, and the love that is natural to them. This new season of writings can also integrate my ongoing learning about Heathenry and Paganism and the evolution of my understandings, both on the scholarly level, and the level of daily life. 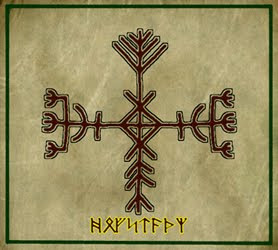 We have taken the name "Hofstaðr"- which means "Sanctuary", because that is what we are for one another as a Heathen family- and what we pledge to be to all modern Heathens and heathen-friendly outsider Pagans who need refuge from a world that seldom understands the kinds of souls we are. If you can find us, we are here for you. The challenges that face families in today's world, and the challenges that face those who embrace an ethnic/religious subcultural identity such as "Heathen", are many. I will demonstrate, to the best of my ability, how our identity as Heathens, and our interactions with the Ancestors, the hamingja-Gods, with friends, the natural world, and with one another steers and guides us through those challenges. Included will be our failures as well as our triumphs (hopefully more triumphs than failures, though) and all of my deepest ponderings about what it means to be both human, and a Heathen today. The entire corpus of writings made by me over the years under the heading of "Cauldron Born" are still here, tucked away in this virtual library, and will always be there. I may refer back to them. I may discuss the ways I have come to diverge from the views I held years ago. Like any living being, I evolve in my understanding, and I'm rather proud to have such a record of my progress- the beauty of the journal, indeed! An honorable endeavor, sir. Looking forward to walking some of these steps with you and yours.